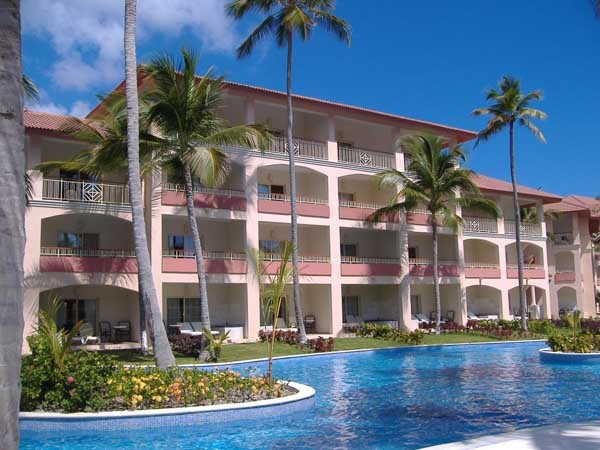 The Majestic Colonial Punta Cana really does credit to its name; it is simply that, Majestic. It is not a common hotel. This huge, perfectly designed 5 star resort is located on Playa Bavaro beach, in an area that gives you the idea of being surrounded by tropical waters. You will be surprised by the contrast of the different blue shades, deep dark blues to the left and clear turquoise to the right. On your way back to the hotel, walking on the fine white sand beach, you will run into an endless winding pool. Small islands all over the pool, covered with palm trees offer guests a welcome shade from the sun and entice them into the water on their way back through the resort. Although the resort’s name could give you the idea of an old construction, The Majestic Colonial Punta Cana is actually quite new; it was built in January 2006.Majestic open concept rooms are all well appointed and their two full size beds or the romantic king size four poster bed helps crate a really Colonial atmosphere. You can customize your retreat; choose from a great variety of luxurious rooms, the one that suits your preferences. Majestic Colonial Punta Cana Review of Activities: Majestic offers guests a great variety of activities, snorkelling is one of the favorite among guests. There are plenty of palapas and chairs throughout the resort and along the beach for you to escape from the sun and lie down to relax. Palapa bars and swim up bars create a dazzling tropical atmosphere for your ultimate vacation. You can also select from a wide range of restaurants that offer guests the best of a multi-cultural cuisine. Relax while your children join one of the two kid’s clubs or play in the large sand castle area. If you are not sitting by the pool or getting a tan at the beach, you can join one of the many activities at The Punta Cana’s Majestic Colonial. Take part in a tennis game, work out at the fitness center, do yoga or aerobics to release stress or treat yourself with Majestic Colonial’s Spa treatments while your children enjoy the activities organized by the kids' clubs. Indulge yourself with one of the spa treatments and let your golf lovers play at the brand new PGA championship course Punta Blanca Golf nearby, designed by the famous Nick Price. This Punta Cana golf course is probably the reason why many people decide to travel to Majestic Colonial Punta Cana and it is no doubt worth the trip. Amateurs can try their luck at the resort’s mini golf course. Try snorkelling or water skiing at the beach or enjoy any of the non-motorized water crafts available to the hotel guests. Majestic Colonial Punta Cana offers you night entertainment every night. Enjoy an island cocktail and relax to the sound of the Sax. If you want to experience the feeling of Caribbean music Majestic Colonial Punta Cana offers Caribbean music shows in the night club, there is also a disco and you can even take dancing lessons. A casino is also available on site. Enjoy the smell and the sound of Caribbean waters. 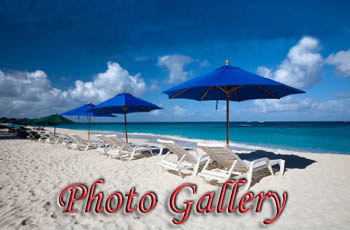 Majestic Colonial Punta Cana Review of Beach: Discover The Majestic Colonial Punta Cana beach. The beach at the Majestic Colonial has no parallel. It juts out into the stunning blue shades of the Caribbean waters. This unique geographic wonder gives you the feeling of being surrounded by the Caribbean invigorating waters. Snorkelling lovers can swim from clear turquoise to deep dark Caribbean waters and discover an amazing tropical marine life. The coral reef is home to the multi-colored fish and other marine animals. Despite the many palapas and chairs available, Bavaro’s fine white sand will invite you to lie down on them and have the feeling of being part of the environment. A great atmosphere and a wide variety of dishes make your Majestic Colonial dining experience unique. Majestic Colonial accommodations offer guests maximum Comfort and Elegance. Majestic Colonial Punta Cana Review of Rooms: The Majestic Colonial’s 659 suites are all designed to fit your needs, that’s why the many categories available. At Majestic Colonial Punta Cana you will always find the room that meets your needs, whether you are looking for a family vacation, or a romantic retreat. 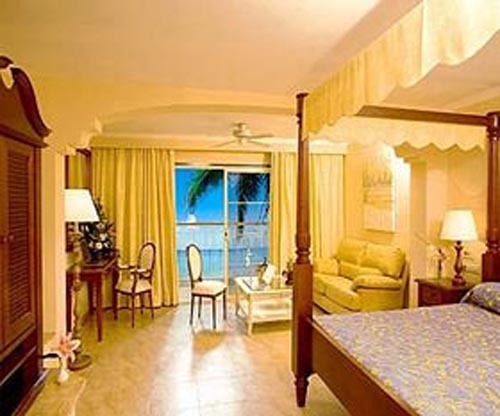 Rooms at Majestic Colonial Punta Cana are equipped with a king size four post bed or two full size beds. Suites with two different rooms are also available. This will give you more privacy and space. Most suites have Indoor Jacuzzis for two and for a romantic touch rooms with outdoor Jacuzzis are also available. All rooms at Majestic Colonial Punta Cana have air conditioning and full bath with tubs and separate luxury showers that have three different settings; rain, massage and soft stream. 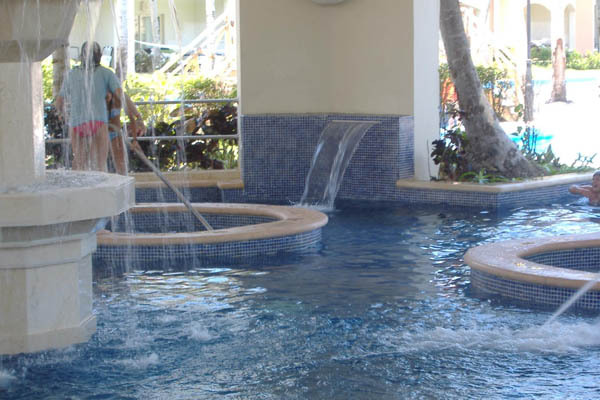 These and other amenities will guarantee your comfort and a relaxed carefree stay at The Majestic Colonial Punta Cana. 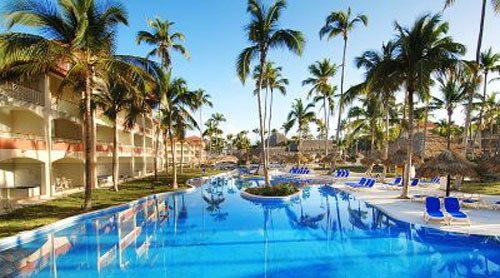 A huge winding pool is the focus of The Majestic Colonial Punta Cana landscape. Majestic Colonial Punta Review of Pool: You will be impressed by the huge winding pool that dominates The Majestic Colonial Punta Cana’s landscape. Majestic Colonial’s pool, designed to be close to all guests’ rooms meanders throughout the resort. It could even be used to get easily from one place to another one in the hotel. There is another pool at Majestic designed especially for children. Its quiet water will let parents relax while children splash about in the pool. The luxurious Majestic Colonial, a beachfront 5 star all inclusive resort surrounded by the exotic vegetation of Playa Bavaro, one of the most beautiful beaches in the world, is the ideal place for an exceptional wedding. This beautiful white sandy beach, excellent installations and the special care of its professional staff make Majestic Colonial Weddings one of the favorite in Punta Cana. No matter what your preferences are, we are sure that Majestic Colonial Weddings will certainly please you, because there is something at Majestic for every taste. For nature lovers, apart from the excellent beach and beautiful surroundings, the natural parks and the semi-deserted islands (the Haitises and Saona) near the hotel, make it a very exciting place. Culture lovers will no doubt enjoy Altos de Chavon, in La Romana and Santo Domingo city. And if you like music or sports stay at Majestic, you won’t regret it. When you pick Majestic Colonial for your destination wedding, all-inclusive-weddings.com takes care of every detail. Consult our wedding packages, but if you want a custom-made wedding keep in mind that all-inclusive-weddings.com is here to please you and make your wedding at Majestic Colonial the dream you have always had. If you are thinking of booking your destination wedding with us, consult our planner for more information.